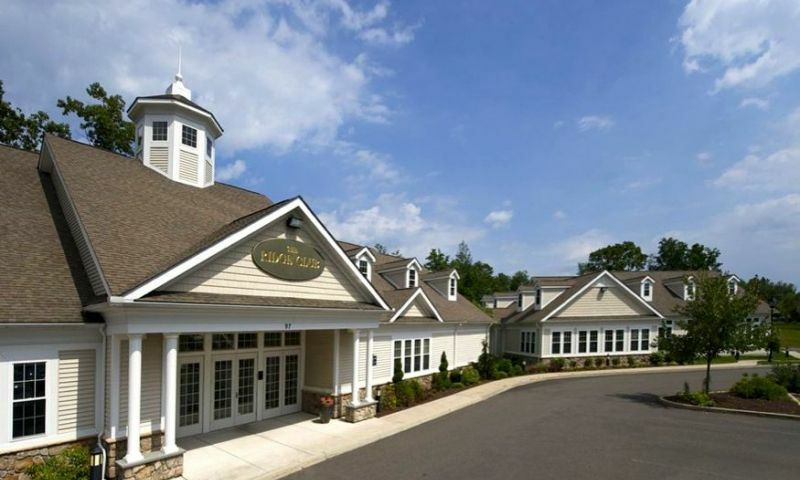 The Village at Oxford Greens in Oxford, Connecticut is a 55+ Del Webb community. This active adult community boasts an abundance of resort-style amenities and social activities along with its maintenance-free lifestyle. The Village at Oxford Greens offers a range of attached and single-family home designs that are tailor-made for active adults. Top features include generous indoor and outdoor spaces for relaxing and entertaining, spa-like master baths and many upscale finishes and fixtures. A trademark feature of Del Webb communities is the focus on superb amenities. At The Village at Oxford Greens, these are more than just pools and tennis courts; they are invitations to meet like-minded people, all while having fun and staying active. Residents in The Village at Oxford Greens enjoy an elegant 14,000 square-foot clubhouse that features an indoor pool, fitness center, multi-purpose room, card room, arts and crafts studio, catering kitchen, and billiards table. Outdoor amenities cater to active adults who like to stay active and swim a few laps in the outdoor pool and play friendly or competitive games on the tennis or bocce ball courts. Rounding out the rest of the amenities are a spacious outdoor patio and plenty of walking and biking trails that surround the charming neighborhood. Active adults also have access to The Golf Club at Oxford Greens that features an 18-hole championship golf course. Residents can play a round of golf for a nominal fee and also enjoy the clubhouse, shop at the pro shop, get a bite to eat at The Cafe or relax on the outdoor patio. The Village at Oxford Greens offers both attached and single-family homes in a variety of unique designs. Options include both ranch and loft plans, many of which directly overlook the Oxford Greens golf course. All are competitively priced and include modern finishes such as granite countertops and stainless steel Energy-Star appliances. Residents interested in attached homes can choose from four floor plans. Each floor plan offers first-floor living and open layouts with optional unfinished basements. Some models have a second floor for extra space. These homes range from 1,510 to 2,148 square feet and have two bedrooms, two to three-and-a-half bathrooms, and an attached two-car garage. These homes are available as new construction or resale. Single-family homes range in size from 1,587 to 2,630 square feet and include unfinished basements. They have two to three bedrooms, two to three bathrooms, and an attached two-car garage. These detached homes are available on a resale-only basis. Entertaining is a breeze in these open layouts, thanks to sophisticated kitchens that open to a great room, dining area, and private deck. First-floor master suites offer sumptuous baths with birch vanities and ceramic tile floors, while guests enjoy their own bedroom, walk-in closet, and full bath on the first or second level. There is a long list of clubs and activities residents take part in including a wide variety of clubs, special interest groups and classes such as photography, painting, quilting, investing, Zumba, Pilates, yoga, walking club, book club and a genealogy club. Off-site activities such as volunteering, day trips and group travel also provide a wonderful opportunity to expand horizons and forge new friendships. Located in western New Haven County, the small town of Oxford features a number of natural attractions, including Southford Falls State Park to the north and Jackson Cove Beach in the center of town. Oxford is also home to the 10-mile Larkin Bridle Trail, a wooded path for hikers and equestrians created from a former railroad track. Waterbury-Oxford Airport, one of the largest corporate aviation centers in the Northeast, is two miles from Oxford Greens. From state parks, gourmet dining, golfing, shopping malls, theater, symphonies, casinos, world-renowned research and teaching hospitals and the beautiful Connecticut shoreline, owning a home at The Village at Oxford Greens provides the opportunity to access and enjoy it all. Ridge Club - 14,000 Sq. Ft. This public golf course is available for residents to use and can pay a fee to play. There are plenty of activities available in The Village at Oxford Greens. Here is a sample of some of the clubs, activities and classes offered here. We built a new home here a few years ago, the Adler plan, and we really love it. Since moving here we're improved our health by exercising almost everyday whether we just go for a walk around the neighborhood, take a class, get on the treadmill or go for a swim. Our social life is wonderful and living here has really made us feel younger! 55places.com is not affiliated with the developer(s) or homeowners association of The Village at Oxford Greens. The information you submit is distributed to a 55places.com Partner Agent, who is a licensed real estate agent. The information regarding The Village at Oxford Greens has not been verified or approved by the developer or homeowners association. Please verify all information prior to purchasing. 55places.com is not responsible for any errors regarding the information displayed on this website.